The G1050 is one of most powerful indsutrial craft available today. Gryphon Hoverworks builds it with an enclosed cargo box with 1695 cubic feet of storage space, however it can also be modified with other containers, or even bought without one. The G1050 is based on a 2003 King? chassis however it is modified so that the driver cabin is on the left side of the craft instead of in the center. This allows for an auxiliary system to be mounted to the front. The front returns to King's old 5-headlamp style, two on each side and one in the center that can pivot in any direction. There are three Revision 3 energy collectors (two large and one small) that provide massive amounts of energy for the craft. Also in the front is a custom Gryphon collector mounted to the right of the driver cabin for powering auxiliary subsystems such as refridgeration units or chemical pumps. 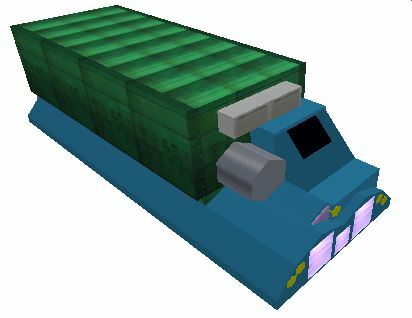 In combination with the energy collectors is a Model 106 fuel cell array, providing enough energy for the heaviest cargos. The craft actually has three engines. In the center is a massive Mover Mk. 5 engine with one main forward-thrust nozzle and two angled-thrust nozzles on each side. In combination are two modified MAD Scramjets? B-class engines mounted on each side of the craft. The nozzles go through a 30-degree turn to provide extra turning thrust for steering the craft through city streets. In the cockpit is Gryphon's reknowned systems collection, providing unmatched performance optimizations as well as numerous security features for the safety of the cargo. The G1050 is also available with an upgraded HoverBed on the bottom to allow it to carry heavier cargos.